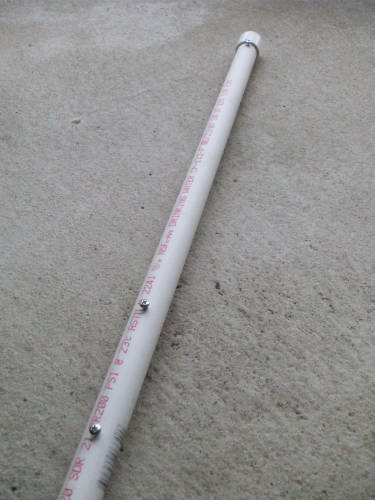 I want antennas for both 10.1 and 14 MHz, but do not have room for a full-sized dipole. 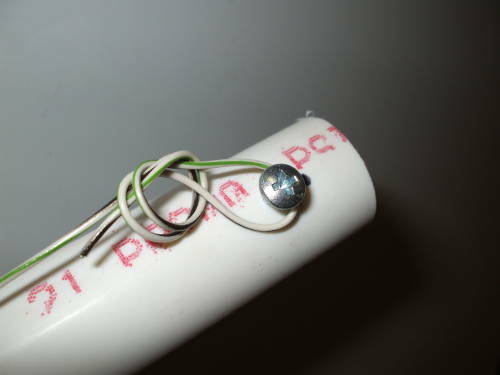 One idea is an inductively loaded antenna. Legs shorter than a quarter-wavelength, with inductors along their length, "uuu" below. The inductive reactance makes the legs electrically equivalent to a quarter-wave wire, at least in theory. A is some fraction of a half-wave. If A = 0.2, then the shortened doublet is 20% the length of a full-size dipole. B is some fraction of the length of its leg. If B = 0.4, each inductor is 40% of the way from the feed point to the end of the leg. Given the size of my balcony, and the availability and relative stablility of 10-foot PVC pipe sections, an overall length of 8-10 feet (2.4 to 3 meters) seemed appropriate. On the one hand, you want the inductors as far as practical from the feed point, as the that preserves as much high-current topology as possible. But on the other hand, the needed inductance climbs fast as the inductor point moves toward the end. A range of 40-60% for B seems reasonable. 10.11 MHz 20% 2.97m 9.74' 116.83"
14.04 MHz 25% 2.67m 8.76' 105.16"
where f is in Hz and L is in Henries (H). Or, f is in MHz and L is in microHenries (uH). 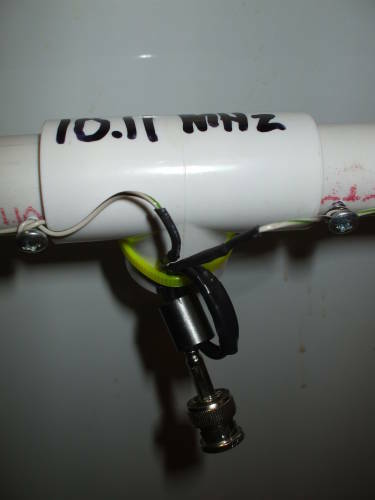 The plan is to use PVC pipe for the antenna structure, and to wind the inductors on the pipe itself. Nominal 3/4" PVC pipe has an outside diameter of 1.0625" (27 mm). 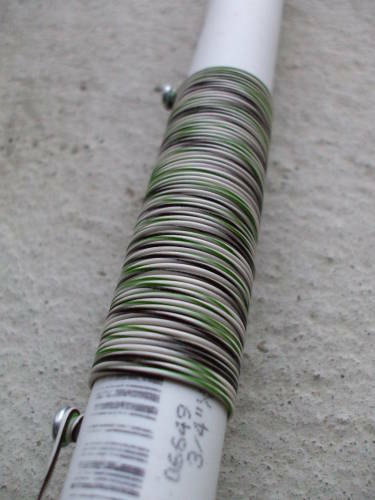 The coils will be 2-4" (50-100 mm) long. The pipe segments are cut to length, pilot holes drilled, and sheet metal screws inserted. At the far end of the wire you tie a half-hitch in a loop and place that around the outermost screw. 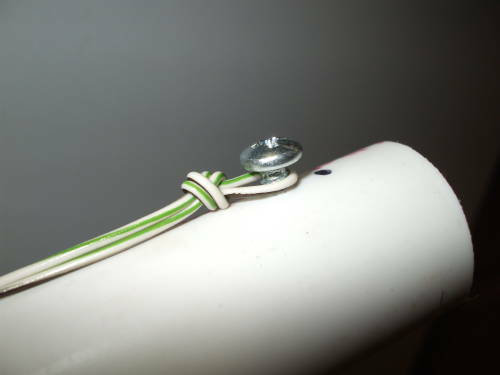 Then tighten the knot by moving the knot itself as close to the screw head as possible. Here is an inductor after winding — 68 turns for the 20m model, 76 turns for 30m. I prepared short pigtail cable left over from an earlier project. 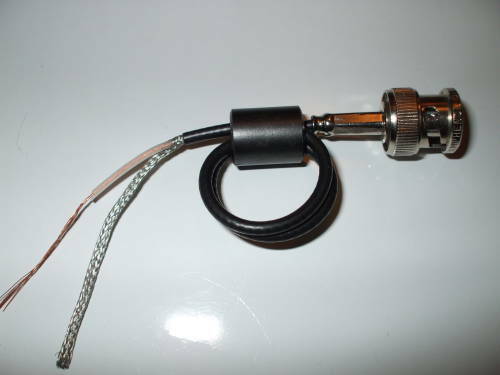 This one has RG-174/U miniature coaxial cable. There was just enough cable for two turns through a ferrite "barrel" salvaged from an old computer monitor. 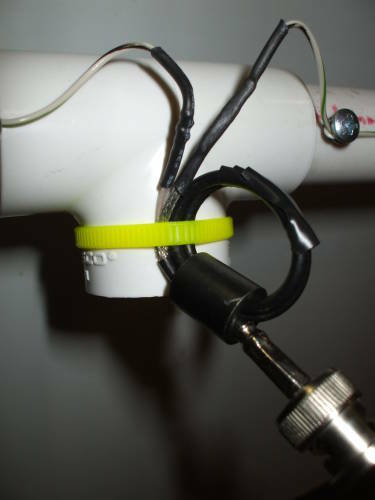 I later wound some electrical tape around the two loops. 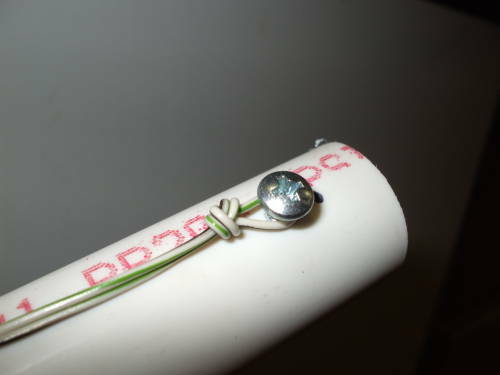 Solder the cable to the center ends of the wires and use a plastic cable tie to fix the feed cable to the center tee. To fasten the horizontal arms to the tee, I used some clear spray sealant. It's mostly spray solvents, largely acetone, which is all that PVC "adhesive" is anyway. Pull the joints slightly apart, hit the outer surface of the ends of the pipe with the spray, and re-insert them, twisting them slightly back and forth to more deeply seat the pipes and distribute the solvent. 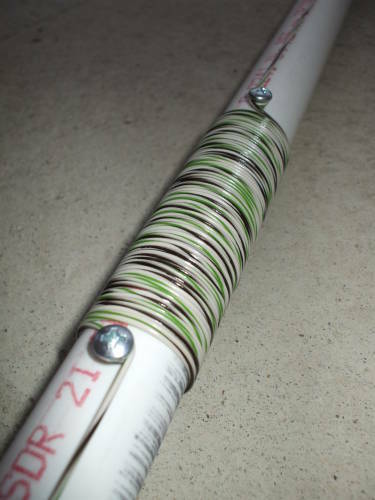 The Petlowany coil ground plane experiments described by, Jake Groenhof, N0LX might provide some useful components for small HF antennas.